In Enaspol we believe the idea that chemistry and sound living environment are not antagonistic terms. 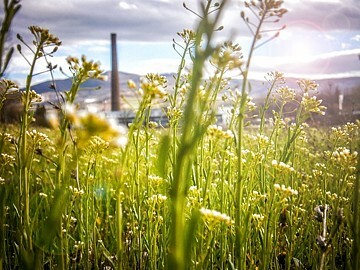 Our corporate philosophy is to connect environmental protection with the production of environmentally friendly products, social aspects of our region and long-term synergy of all these areas. We are fully aware of the need to take responsibility for sustainable development of the company while respecting the needs of people and supervisory bodies that make our development possible. We are therefore trying to minimize the impacts of our industrial activity on life and health of our staff, on the plant’s neighbourhood but also on life of our customers by supplying them products they can without any fear use to achieve their sustainable goals. With increasing demands of the world population we face accordingly higher requirements on our products and accordingly higher demands on our production conditions from respective supervisory institutions and bodies. One of the company goals is a constant growth of the added value of our products which can, by no means, be done at the expense of environment because sound environment and quality of life must be preserved for the future generations. Production-wise we have recently adopted a number of measures to reduce emissions and off-drips, gas and electricity consumption as well as measures to reduce and recuperate wastes from the production. The company has its own biological waste water treatment plant which, in addition, treats waters of adjacent locality. In the laboratories we continuously monitor waste waters at both inflow and outflow points of the WWTP. We permanently look after minimization of the waste generation and deep emphasis is put on recycling of wastes and, if possible, their return to the production. Moreover, Enaspol cooperates with external suppliers of waste management services and constantly monitors compliance with legislative requirements from their side as well.